A business occurs when an individual or an organization makes a profit based on the goods or service they offer. One of the main purposes of a business, besides making a profit, is to attract a customer base. A customer is an individual or an organization that purchases the goods and/or services from a business. The profits that a business makes is not the only way to measure their success, another way to measure their success is by their customer satisfaction. Customer satisfaction can be linked to a business’ customer service; which is how a business helps and supports their customers. There are many different ways for a business to support their customers, especially now that technology is so linked to everyone’s everyday lives. This is why integrity is important in business. Integrity is when a person follows a strict moral code that is unshakeable or unbreakable and is shown in everything they do, say or think. Business integrity is the same thing; however, it is a business that is doing it. Integrity starts with at the top and works its way down, and it will show in everything a business does. Businesses that have integrity do not put profits before their customers and their reputation. Having a business that uses integrity will help attract customers and will also help attract employees that not only care about their jobs but are more likely to stay with the company than leave for something else (which will save you from a high turnover rate within your company). A reputation is everything, especially in business. There are many ways for a business to keep a reputable reputation. You want your business to have a great reputation because an excellent reputation can increase your profits. There are ways to keep up a good reputation: one way to do this is by always doing what you said you would. Even if something arises, you should inform your customer of this and than find someone to take your place. Make sure the person you find to replace yourself, is just as good and dependable as you are. You need to make sure you communicate with your customers often. This lets your customers know that you haven’t forgotten about them; however, you don’t want to email them constantly to the point where you become annoying. Usually only email them once a week to let them know what is going on is good. Another good idea to keep your reputation good, is by having an online presence. You can use a website and/or social media. Your clients will be able to know who you are and what your products are, along with being able to keep in contact with you. An online presence makes it easier for businesses to ask clients for their feedback and for any ideas or suggestions they may have. Also, businesses are able to address any rumors that maybe being spread about them quicker. Employees are key to any business, especially when it comes to a business’ integrity and reputation. All staff and management should always treat each customer or client as if they are family or how they (as in the employee) would want to be treated. It is important to show your customer that they are important and treat them with respect because people are more likely to tell others (who could become future customers) if they received either extremely amazing service or extremely horrible service. When customers are treated with amazing service, they are more than likely to become regular customers and bring in new customers. So all staff should be trained to work with integrity. When you have managers and those in leadership positions that work with integrity, you should see a trickle effect. Those in leadership positions should show that they have integrity and set an example for others to follow. Managers and others in leadership positions should support their employees and be available for their employees. Leaders should be able to communicate with their employees, patiently, honestly and with civility. They should never speak to their employees in a condescending tone or a cynical tone. Managers should also watch their nonverbal cues; such as eye contact, body posture, and facial movements. Also, when your managers and leaders behave with integrity, their staff will respect them and be more willing to go above and beyond for them. Another idea for a business’ leaders and managers would be to assemble some type of code of conduct or code of ethics for their employees. In the code of conduct, (or ethical code), the leaders should set a standard of ethics that all employees need to follow. By doing this, employees know what is expected of them; they will also know what to do if certain situations arise. Also, by knowing what is expected of them and that their leaders have a standard of integrity, the staff will be more willing to come forward, if a problem should arise or if they have started to notice unethical behaviors. One measurement of a business’ success, is their customer satisfaction. Customers want to be treated with respect and honesty or more simply stated with integrity. They should also be patient with their customers because it is one of the most essential skills in customer service. The staff should also practice active listening along with their communication skills. This also goes along with going the extra mile for your consumers. Staff should know and try to anticipate their consumers wants and needs, be consistent towards each customer and offer to fix any mistake you may have made. Another way to help meet your consumers’ needs is to be transparent. This is important to build trust with your consumers. Linkedin is the largest network of professional people; it has over 550 million users in more than 200 countries and territories. In 2016 Linkedin was acquired by Microsoft. Linkedin’s mission is to connect professionals so that they can become more productive and successful. 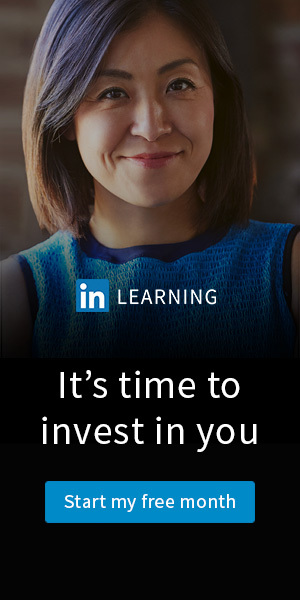 Linkedin does this by having a learning system, Linkedin Learning. You can either purchase it for yourself or for your entire company. It offers over 5000 courses in business, creativity, and technology. These courses are created to give their students in-depth, educational instruction. You are also able to add your own content to the site, that you want your employees to learn. Also, the courses are available in multiple languages, such as English, Mandarin, German and French to name a few. The courses are taught by experts in their fields from all over the world. They offer over 1,000 business courses, 2000 creativity courses, and 1500 technology courses. Some topics that are offered in the business section are leadership and management, human resources training and customer service training. A few of the topics that are offered in the technology section are web development, network and system administration, and database management. Some courses offered in the creativity section are online graphic design training, web design and user experience. LinkedIn Learning is made convenient for all users. It has multiple forms of learning styles, for every type of students. Students are able to read the course content, listen to the content or watch videos about the content. Students are also able to access Linkedin Learning on multiple platforms. These courses will not only help your employees gain helpful skills but will also allow you to network with other companies. You will be able to teach your employees about integrity through one of the courses. Once all of your employees are on the same page and using integrity with your consumers, you should see your profits increase.